~ The symbol for Krishna lila is not the ostrich. ~ God alone. God alone. God alone it is. ~ It appears to me that the “teacherless” student can be compared to a sculptor working on “carving” his own body. He’ll do OK on the front, make it really nice even, but he’ll be helpless on the part he CAN’T see, his backside, without a mirror of some sort. That mirror is guru. ~ Vedanta is the end of all the knowledge. That knowledge is not called a “lamb” but rather, a “lion.” Such is its power. However, just because that lion roars does not mean violence has been done. ~ Erudition is not the same as realization. ~ One of the most profound realizations I’ve ever had (I discuss it in “Guru Jyothi ~ a light on the Path”): it is our egos which point and claw at the mirror, always finding fault with the mirror, not seeing the mirror for what it is—a reflection. But when we clean our own dirt off… so does the mirror at the exact same time! ~ Friendships are like gardens, but a very special type of garden… to produce tasty fruits of Joy and flowers of ever-increasing Love, it takes two gardeners to tend to it. ~ I recently posted in Amazon.com’s “religion” forum (which might more appropriately be called the “atheist” forum). Another lesson learned, that is, fanaticism doesn’t confine itself to those who “believe in God.” There are an equal number of fanatics who “don’t believe in God.” And just like believers, some are quite well-meaning while some are just plain mean. Such variety our Beloved has created here! ~ An ongoing practice in self-control and mindfulness sadhana (spiritual discipline) is abjuring a belief in personal doership. It is remembering that the feeling, the thought, the sense of “I do it” is ahankar—ego experiencing illusion. The Reality is that Self… and only Self… does it all, enjoys it all, created it all, is all: author, actor, audience, stage and props. ~ I watched Benji’s cat Sarah get all lovey-dovey again the other day with her paw-sized stuffed monkey—one which we both thought surely must have zero power to attract and enthrall any longer; the herb in it surely was dried out, the toy had lain dormant for so long, Sarah’s apparent non-interest was long-standing. But no! Rather like a latent vasana in that regard, the desire to enjoy was lurking—well waiting, anyway—to sprout again and thoroughly entrance a normally sedate and self-controlled kitty. Watching this phenomenon, I have come up with a way to remember the enduring power of maya to distract. When I discover my mind excited and giving full attention to the waking or dream state desire du jour, I hush it now with one word. That word is: Catnip. ~ God is. Prakriti (the creative power) enacts His story. ~ A paradox: Only timelessness can create the sense of time passing. Only timelessness can experience it. ~ “Daughter of God” is a relationship, a role… not an identity. ~ O mind! Be still! Reality is beyond your daydreams and nightmares. Why do you insist on endless launches into flights of imagination, creating thought-forms to play with? Be still! Enjoy the Tao now. ~ While watching my petty mind grumble, resist and ultimately pass on the opportunity to make yet another cup of coffee for an able friend residing with me, I returned from the kitchen with my own steaming cup and realized what a foolish thing I had just done. If I had made and offered that cup of coffee to God in my friend, it would have been God in my friend who responded. ~ Arrogance is an enemy, an attitude and usurper of peace given more power the tighter one clings to his ignorance. ~ The formless Fire within which consumes our garbage does not require a fuel source; and the forms of fire from without which desire to consume what remains will suffocate without one. Reveal Thy will in me…. I enjoy You enjoying Yourself! Do You approve? Do You receive? Is in the joy of loving You back? What has happened? People are lamenting and tell me that Guruji has died. Really? Can Guru die? Over and over, Guruji told us that Guru is the Light eternal–omnipresent, omniscient, omnipotent. Surely THAT cannot die. People speak of loss. But what is lost? Think about it. The only thing gone is an ailing body, a bundle of bones! Guruji used to address this body in the most unflattering of terms, calling it a hotel for worms! That surely is not the guru! His hotel of late was giving him nothing but pain and trouble. How much he suffered without complaint, more than any of us will ever know. Isn’t it selfish to wish he’d stayed around longer? He did his job and left. We pride ourselves that we didn’t question his selfless wisdom while in the body. It would be hypocrisy to question it now. And if we persist in seeing these events in terms of, “Oh, he left us, oh, he’s gone!” then we are unworthy of his sacrifice and cheapen the memory of his dedicated life. Reflect thus. Did he sacrifice SO much to give us knowledge of the essence of truth, guru and righteousness–satya rasa, guru rasa, dharma rasa–only for us to ignore or forget that knowledge when the time comes to use it? If so, we are like the frog who lived very near to the lotus flower of knowledge but instead of appreciating a beautiful flower wallows in the mud at its base. Or compare it to the lady we saw yesterday riding behind her husband on a scooter holding her helmet tucked under her arm instead of on her head! To think Guru will not continue to guide, love and inspire is asat, untrue. When Guru was in a body, but out of the country, did he not whisper in the quiet temple of our devoted hearts? Did he not visit in dream or meditation? What nonsense to think that ability ceases when the body ceases. It isn’t of the body! We must practice what he taught us. We must watch our mind and constantly choose thoughts which are truthful. This is the path to bliss no matter what adversity befalls us. Each and every blow we receive is a new opportunity to practice the teachings. When will we begin if not now? When the next blow comes, and it surely will, what then? Have we prepared ourselves? Please think about this, too. If we encourage Guru Mata to grieve, or if we burden her with our grief, what kind of service is that? For all circumstances, we can ask ourselves: what would Guruji do? He would remind Mataji of her strength; he would remind her to take refuge in God’s Holy Name, control her mind and emotions to achieve and maintain equanimity. He would tell her to trust and surrender, wouldn’t he? Every effort counts. Even if we fail 3 out of 4 times at first, we must make an effort again. Soon it becomes easier and success is ours. In my heart you lit and fanned the flame of bhakti, that mysterious fire of love which burns night and day. In the course of its journey through my being, it sweeps up for review all the flaws of my personality. With my consent and not without it, the fire of true bhakti consumes my illusions. To my ego, this causes a momentary pain sometimes so severe, I cry out in agony. But give me the strength to endure the process. Oh, Guruji, bless me with more and more bhakti! In my mind you installed the lamp of discrimination. You taught me to fearlessly lift that lamp high and examine relentlessly all that I see, hear, taste, feel, all that I think I know. Is this real? Is this true? Is this eternal? Yes? Cling with all my heart to that. No? Let it go. Sometimes, it is shocking to find out the truth and it requires courage to face it. So many times you reminded me that truth is not for the weak. I thought I was so strong, so brave. Oh, Guruji! You know. Bless me with more and more discrimination. Into my hand you gave the sword of detachment. God! That sword cuts to the very root of my misery, but what a difficult practice! How many more blows must I endure before I am finally free? How many? My heart is bound and weighted down with attachments–to family, to friends, to feelings, to thoughts. Bless me, Guruji, help me surrender my attachments gracefully, now, today, this moment. Help me keep that magnificent sword razor sharp, ever ready. Oh, please, please bless me with complete detachment! And in my heart, you discovered the seed of dedication. You patiently watered it with knowledge and love of service. In so many small ways, you permitted me to serve God in you and in His creation. Right here and now, I affirm again that every breath left in this body is offered to the Lord’s service in whatever capacity He wills. My dreams and schemes I surrender in this prayer. May God’s will alone manifest through me. Bless me, Guruji, to remain dedicated to the ideal of Truth, sat and righteousness, dharma. Bless me that I never stray from that ideal in all my affairs, even should I stand alone in this world. I will hold fast to Truth. It is an unfailing friend, an anchor in the ocean of change and turmoil. May I cling to, serve, breathe, worship and salute Truth always! Thank you for all you have given me and for the knowledge which sustains me now in this hour of grief. I look toward you for continued guidance, help, love and knowledge. You have said that Guru never fails his disciple. I trust it is so. I offer my love to your lotus feet, the treasure of my life since the day I first met you. I bow again and again to Panduranga, the Light of my Heavenly Father which you revealed to me on that very day. ~ If you don’t really want to know, don’t ask God for the Truth… not even once! ~ I don’t do “small talk” with family and friends. Big talk sometimes results in hurt feelings followed by flight. What to do? Remember the unfailing Friend when offering salutations to His front and then again to His back if He flees. 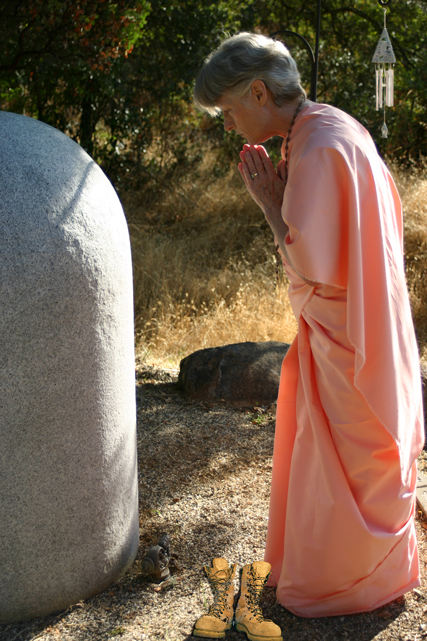 ~ A wavering mind on the path of jnana yoga is disastrous. Likewise, a wavering heart on the path of bhakti yoga. Practicing yoga is a matter of personal choice but it does have some caveats. They did or they didn’t. ~ What looks like almost never is like; take, for instance, the Sun. No wonder the ancient sages compared him to God. Always looks like He’s moving when He’s stillness itself. This heart itself is Yours! and we’ll be One forever? Were it not for Your grace…. ’til reminded of their true nature. To dance once more with the Fire. Scatters the cloud of ignorance. ~ Doesn’t it feel sometimes like the spiritual path traverses a cliff on the side of the mountain to Self-realization? No matter. Guru’s knowledge is a hand reaching down; His grace is a hand boosting up. ~ Did you ever contemplate that if you pray to see God in all, it would mean God in all can see you? Are you ready for that? ~ The dramas of life are the sum of choices made before and during this birth. None of them are the Truth of me. When I can dance to the flute of our King? With Light God shower’d on me.